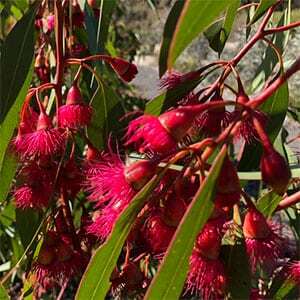 From the Eye Peninsula in South Australia, Eucalyptus petiolaris is a small to medium sized tree. The most widely grown is the is red flowering variety, although white to pink flowering types are also found. It is mainly grown as an ornamental tree, also used for stock shelter, light shade and to assist with erosion control. When in flower, the small flowers appear in clusters and will attract bees and insects to the garden. Best grown in full sun well drained soil. Once established the tree requires little to no care at all. This is a species that can be successfully coppiced, making it useful in a wider range of landscaping situations. 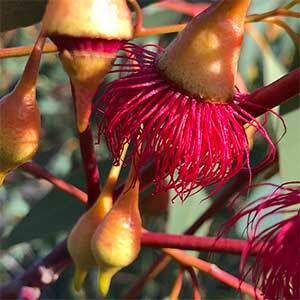 This is a tree that can be propagated from seed and will usually come true to flower colour. Position – Full sun to light shade. Soil – Well drained and moist. Height – To around 15 metres often less. Spread – To around 10 metres often less. Flowers – Red, White, Cream or Pink depending on variety. .
Flowering Time – Winter into Spring. Foliage – Mid to deep bluish green. Frost tolerant – Yes, light to moderate frosts once established.